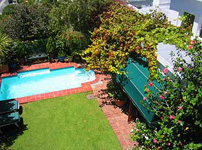 Villa in Camps Bay, serviced daily, luxury living. Situated across the road from bowling club, tennis and squash courts, and a playground/park and 1 minute from the beachfront! 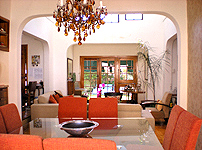 Price is highest during peak season, and may vary according to number of occupants. The Bayleaf also has three self-catering rooms, which can be let separately, but which are not available when the villa is let as a whole. 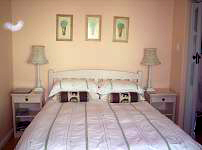 Very large room with twin beds and bathroom en-suite, built in kitchenette, microwave, bar fridge, toaster, kettle. Colour TV connected to DSTV. 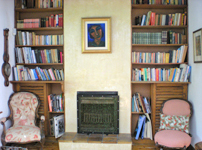 Lovely bright, sunny room with French doors leading out to garden and pool. Stunning views of Lions Head. Queen-size bed and bathroom en-suite. Bar fridge, microwave, kettle and toaster. Colour TV connected to DSTV. 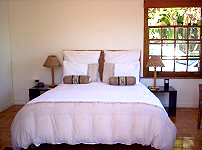 Small, private room, with double bed, bathroom en-suite (shower only). Kitchenette outside in covered patio with table and chairs. Bar fridge, microwave, kettle and toaster. Colour TV connected to DSTV. 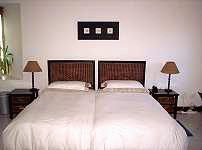 Rooms are serviced daily, except Sundays and public holidays. If required, a continental breakfast tray can be provided, at an extra charge.